This is the only time I’ve ever painted the Baron accompanied by ‘Granny’ and Irini. Also I got to include his adviser, the Sengir Autocrat (originally painted by David A. Cherry), and his henchman, Veldrane of Sengir (originally painted by Susan Van Camp). October 1995 saw the release of the Homelands expansion for Magic the Gathering. 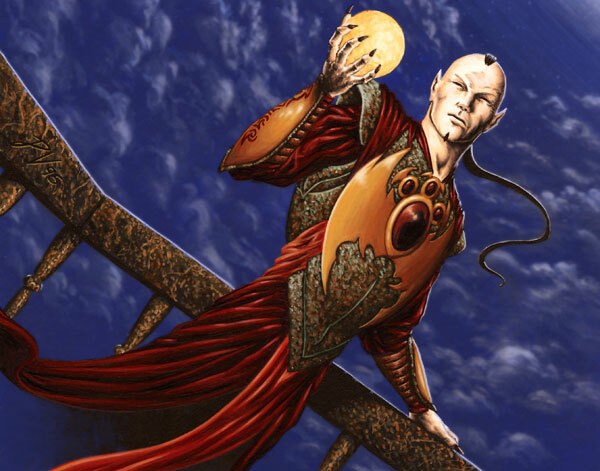 While the set was unpopular with players, it remains one of my favorites because I was given the opportunity to bring to unlife Magic’s First Family of vampires – the Sengir family, and most importantly, their patriarch Baron Sengir.